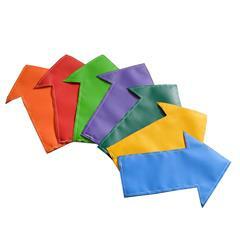 Keep kids moving in the right direction with Vinyl Arrows! The Vinyl Arrows are made with standard 18 oz. double knife-coated vinyl and back with either 4" hook fastener or a grippy non-skid material. They come in a set of seven different colors. We guarantee that you'll use all seven in just the first day! Better get two sets to have a couple of extras! The 4" hook fastener works incredibly well on Carpet Bonded Foam. 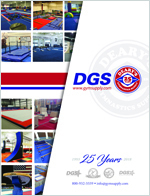 Great for keeping young ones moving in the correct direction through exercises and obstacle courses.